food: the red wagon, vancouver | eat. drink. fly. 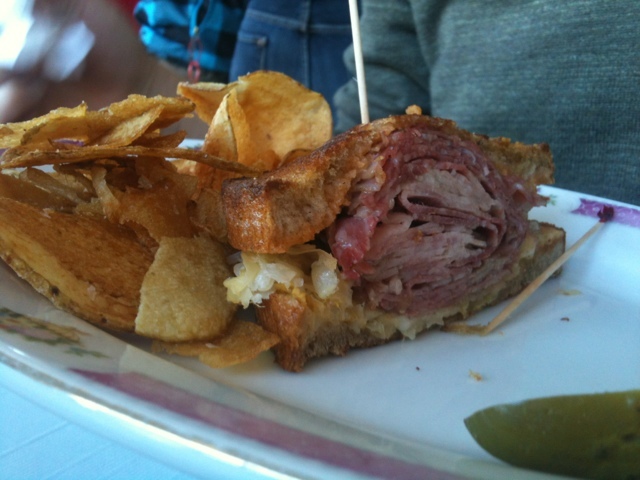 on monday, we made a visit to one of the places featured on diners, drive ins and dives. 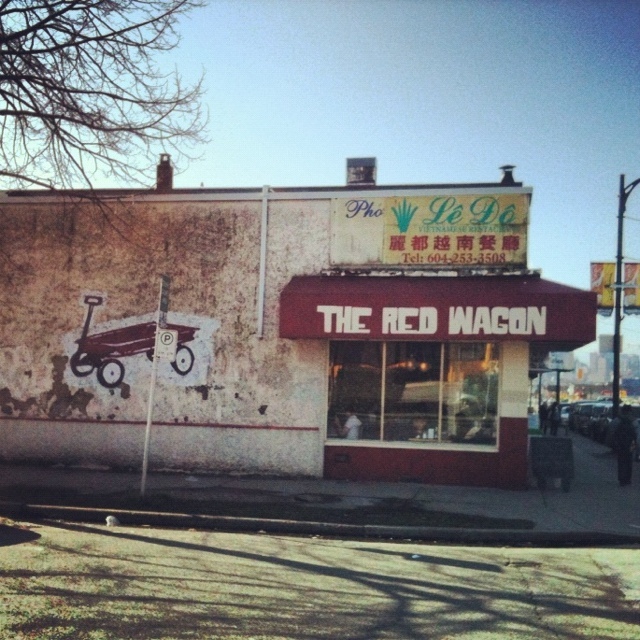 the red wagon in east van. this is has been a place i’ve driven past a bazillion times and always noticed it looked funky and busy. really busy. like, there’s usually a line up outside during peak times. i’m a fan of el bario, with is in the same block, but this was a place that intrigued me… and so i’d listed it on my mental “to do”, but never been particularly fussed about it. and then guy fieri showed up. the episode of DDD aired on 27 Jan, and ever since, this place has been even busier. my husband and i were in the area, buying produce at donald’s and since we were parked and RIGHT THERE, we decided to pop in for a meal. the signature item here is the pulled pork pancakes. now, obviously, i don’t eat pancakes and my husband had just eaten a pretty big breakfast, so he wasn’t in the mood… so we looked longingly at the stacks of deliciousness on neighboring tables, but decided we’d save it for another trip. my husband went with the Ruben. the phrase “house brined beef” sold him. he deemed it to be an excellent sandwich. i got a cobb salad. 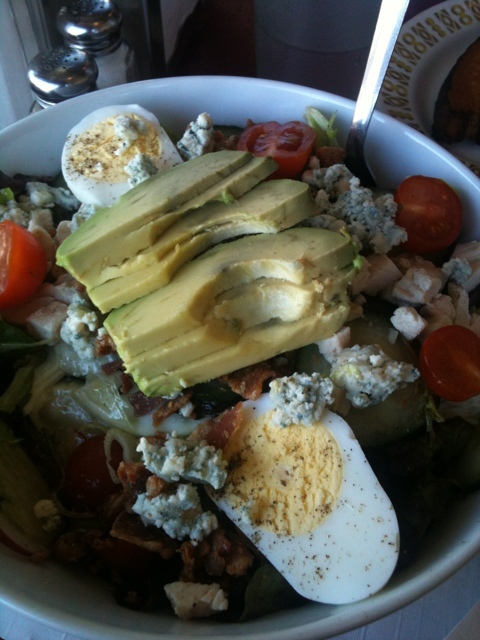 and while it was good, it was just a cobb salad. nothing crazy or special about it, just a really good solid salad. the dressing was really nice. but the rest was just pretty normal. one thing though… it was MASSIVE. i only made it about 1/2 way through before giving up. i also ordered a cup of the smoked tomato soup. wow. now here’s where i ventured into “something special” territory. after picking out what looked like absolutely beautiful buttered croutons, i devoured this. the pesto on the top was perfect… the soup itself smokey and creamy and rich. 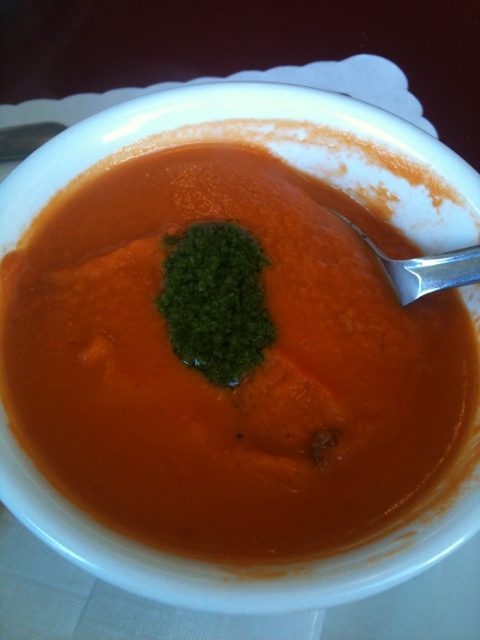 i love a good tomato soup and this was one of the best i’ve had in vancouver. and then… the real magic. 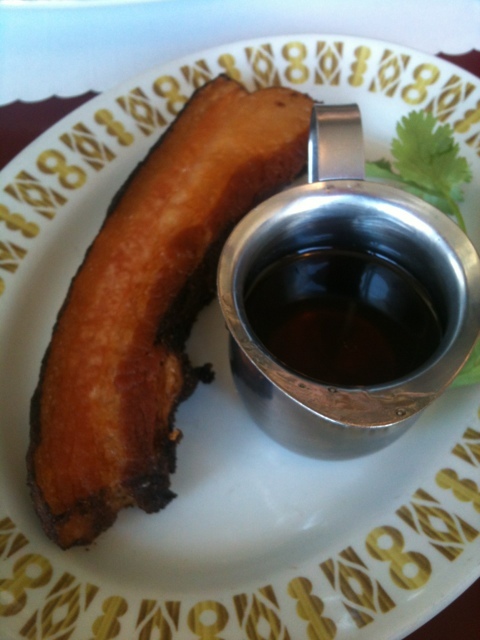 we got a side of the crispy pork belly and JD syrup to dip it in. i’m not sure this picture really does justice to the fact that this is a slab of pork belly. as we saw on DDD, they confit it until perfectly cooked and rendered and then slap it on the flat top to crisp it to order. the word WOW is a freaking understatement. and the syrup… i don’t even like jack daniels and this was incredible. you got the hit of the booze with the most delightful maple finish. these two items are friends. make sure you pair them together. all in all, a massive success. the woman at the table across from me ordered the crispy pork belly sandwich, which looked like a play on a banh mi and she declared it to be the best thing on the menu. I need to eat that! well…all of that!